Education is at the heart of everything Liberal Democrats stand for. Education is the key to freedom and opportunity, and a vital part of creating the fairer society our Party seeks to build. Judith believes that every young person, no matter what their background or circumstance, can grow up to achieve anything they set their mind to. Judith will resist the Tory cuts to funding that are impacting so heavily on our schools. It is a tragedy that in 21st Century Britain, the wealth of a child’s parents and where they are born are still indicators of how well they will do at school. Here is West Berkshire, despite the fact we are a fairly wealthy area, and we have fantastically dedicated teachers and head teachers, the achievements are not as high as you might expect. Even at primary level, the Conservative’s inappropriate systems of assessment and ongoing reduction in school budgets run alongside unrealistically high levels of accountability. Maths and English are critical, but they should NOT exclude youngsters’ many talents and skills in the wider curriculum. Judith grew up with a Mum who worked in a secondary modern school, a father who taught engineering at the local technical college. She and her sister were the first in their family to go to University and she has worked as a teacher, herself. Judith knows the value of a good education at all levels. She also knows that for schooling to be a success teachers need passion, energy and fun, all of which comes from space to breathe. Richard Benyons’ Conservatives and their negative, box-ticking attitude is causing school leaders across our area to leave the profession. You can read what the Head of Hungerford primary wrote to parents earlier this year, here. What we need is a can-do leadership in our area to build on the dedication and inspiration of our teachers. We are committed to working with education professionals to tackle the workload and recruitment challenges they face. To ensure every child gets the support they need, our education system must be properly funded. We were proud to introduce the Pupil Premium – additional money to support pupils from disadvantaged backgrounds – when we were in Government. Liberal Democrat policy is to protect school funding in real terms, from the early years right through to college. Find out more about how West Berks schools will be impacted by school budget cuts in the coming years under a Conservative government. 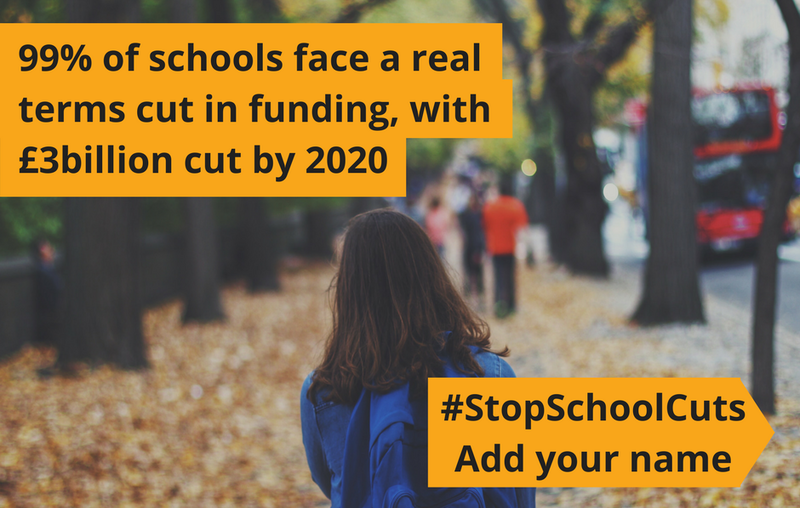 Find out about the Lib Dem pledge to #StopSchoolCuts and invest more than £28m to protect school funding in Newbury & West Berkshire alone. Also, access to education and new opportunities should not end at 18. 40% of all post-16 funding comes from the EU. No one is currently talking about how this will be replaced post-Brexit. Where are the Conservative plans? Lib Dems introduced a record number of apprenticeships in the last Parliament, to support people to gain new skills or change career at any age and we want to see greater investment in adult skills training and further education colleges. Judith does not want to see that positive change fade because of Conservative neglect. If you want to change education in the UK and change the future of Newbury, vote for Judith Bunting on June 8th.